Phil Spencer, Executive Vice President of Gaming at Microsoft, went on stage for the Xbox E3 2018 Briefing on Sunday and announced that five studios would join Microsoft’s internal first-party roster: Compulsion Games, Playground Games, Ninja Theory, Undead Labs and The Initiative. Following the huge news, Spencer appeared in yesterday’s Inside Xbox E3 2018 special episode and talked a bit about the acquisitions as well as the fact that Microsoft remains open to expanding even further in the future. Those are the studios we’ve had a long relationship with. We were able to invest in them in a way that’s going to unlock their creative potential. I think about a team like Ninja Theory, which I’ve worked with back on the original Xbox for Kung Fu Chaos; Playground Games, we’ve worked with them on Forza Horizon, they wanted to go off and do new things. And then Darrell Gallagher, who we worked with for Tomb Raider. He wanted to create a new studio (the one based in Santa Monica) and we said yes, it would be a fun thing to do. It’s an investment we needed to make. I think we’re always open to look into expanding our first party. I don’t think Matt (Booty) and I looked at E3 as the end of our journey here. I think it’s something we’ll always keep our eyes open. Some of these deals may not all happen at the same time, we were lucky to be able to keep the news quiet for a while, which doesn’t always happen but was nice that it did so we could land the news here and the surprise. We know investment in our first-party, whether it’s new things or growth or existing franchises, is important. 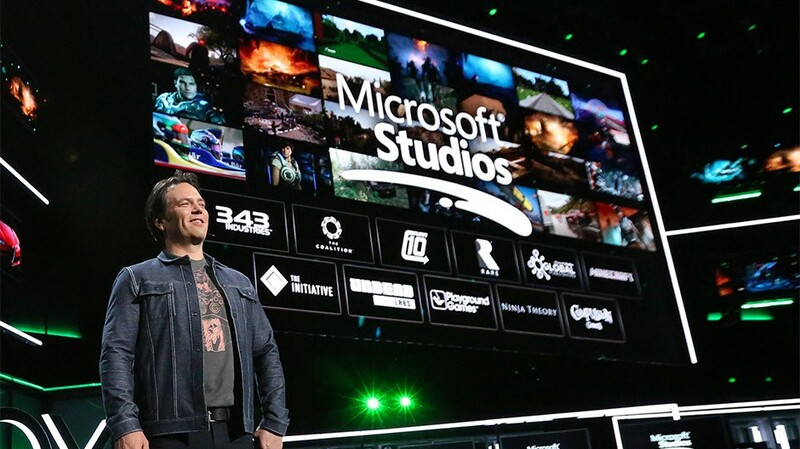 Spencer then focused on the Initiative, the brand new studio founded by Darrell Gallagher, hinting that they are looking at some of Microsoft’s dormant IPs right now. Darrell Gallagher is a twenty-years veteran developer, recently he was at Activision. Then we had a discussion about what he wanted to do next, I think he loved his time at Crystal Dynamics with Lara Croft and reworking Tomb Raider. We were talking about some things in our past that might be interesting, nothing to announce yet, but just some things that he might want to work on. Gallagher may be poised to repeat another revival, then, after Lara Croft. If we wanted to bet five cents, we would do it on Perfect Dark as an ideal fit. Lastly, Spencer said that the next projects from the newly acquired studios might have very different schedules. For instance, Ninja Theory is already working on something as they shipped Hellblade almost a year ago now, while the other teams are still busy on existing projects. They’re all kind of in different places. For example, Ninja Theory’s Hellblade shipped a while ago and they’ve been working on some things, whereas Undead Labs just shipped State of Decay 2, Compulsion will ship We Happy Few in August and Playground’s Forza Horizon 4 ships in October. The nice thing is that we start mixing them with our all other studios that we have, we’ll really start to get a diversity of things we can talk about and I’m excited about that. What’s your opinion on these new acquisitions by Microsoft?